To try the app out for yourself, follow this link, then click ‘log in’, then ‘create an account’ to sign up and get a 14 day free trial (instead of the usual 7 days), then download the app on your phone and log in. 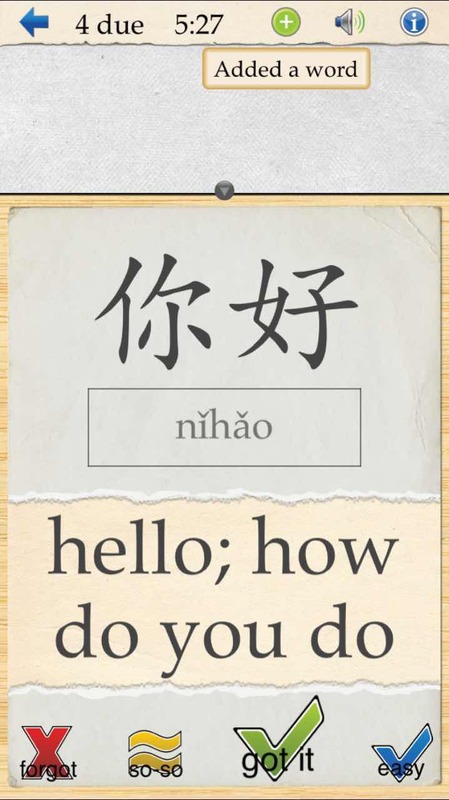 When I was studying Chinese at university, I was always also quick to catch on to any gadgets or new pieces of software that might be able to help me learn Chinese – especially reading and writing characters. 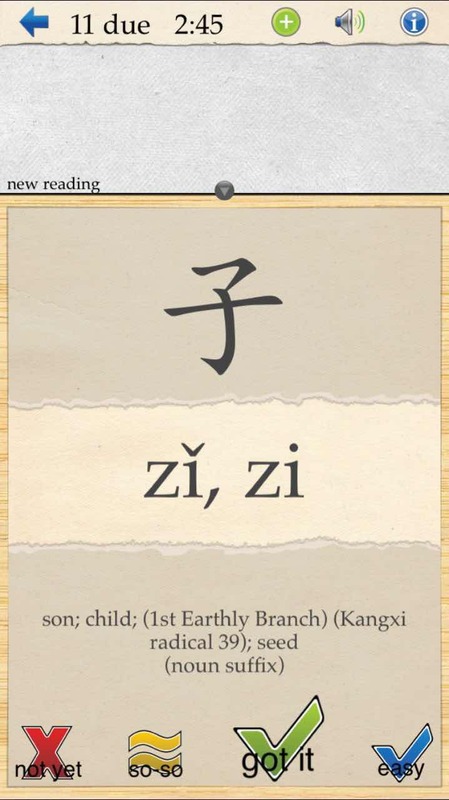 I had various pieces of flashcard software, including Anki, which I added characters to on my own, and revised the pronunciations and meanings of them whenever I had a spare moment. I also did a lot of Chinese character writing practice. I wrote them for exercises, I copied them based on the guides in books and the programme Wenlin. I even traced them on the sofa with my finger while I was watching TV. My method worked, but it took a lot of discipline and I had to pretty much connect everything together on my own, and I guess you could say it wasn’t always that much fun. Then again, back then there was nothing like Skritter. I had been wanting to give Skritter a try for some time, and finally I decided to sign up for the free trial and give it a go. 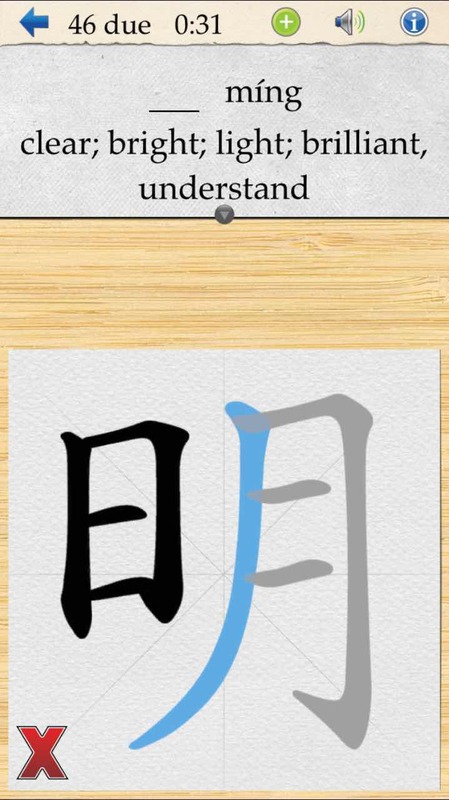 Skritter is an app for the iPhone / iPad / Android phones and also a website which integrates all the parts of character learning (either simplified Chinese or traditional Chinese characters) into something that is genuinely really fun. It’s almost like a game, but you have the added satisfaction that you are actually learning a lot, and it can be pretty addictive! For the purposes of this review, I started from the beginning with the Skritter Chinese 101 list that the app recommended, and even though I knew the characters already, I could still barely put it down! 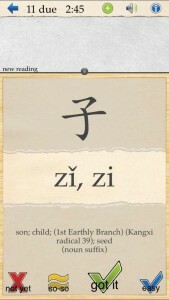 Chinese characters are one of the hardest parts of learning Chinese, and one of the major things that puts people off. You have to get in all the practice in reading and writing Chinese that you can get. 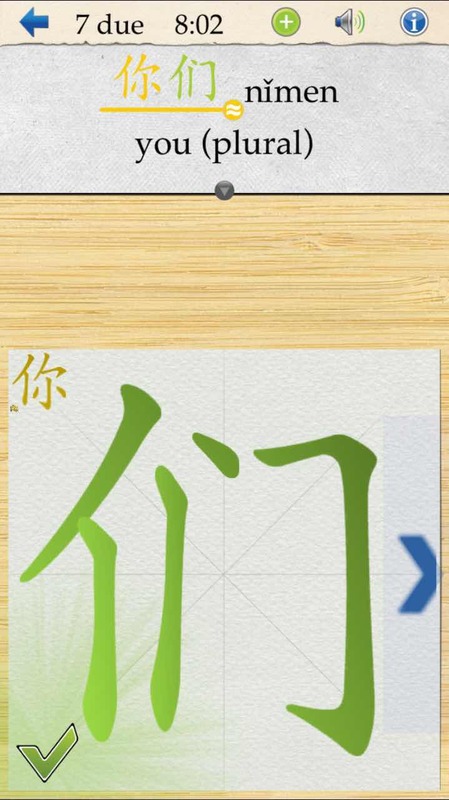 Whether you are studying Chinese in a class, or just as a hobby when you get a bit of spare time, Skritter is a great tool, because you can practice characters anywhere, whenever you get a spare moment (it’s best to use it a bit every day). Being able to recognise Chinese characters is one thing, but being able to write them is another. Skritter tests you on the pronunciation of characters, the writing and the meanings (the three things you need to know for each character). You get the repetition you need to get them to stick in your head, and it also adjusts to you by giving you the ones that you don’t know so well more often. The app does have a website version, but it works best if have a tablet for your computer (I bought one on a whim once but I haven’t really used it much) because it feels clumsy trying to write characters with your mouse. With the phone/tablet app though, you write the characters and trace the tones with your finger, which is much more convenient. If you don’t know how to write a character and you want a hint, you just single tap in the middle of the screen, and it will indicate the next stroke (or double tap to reveal the whole character). The best thing about how it works is that it really trains you to write the strokes of the characters in the right order (which is important to getting them looking right, and is something many learners never master). If you write a stroke out of order, it will accept it, but hint as to the stroke you should have done, and if you write the stroke in slightly the wrong way or the wrong direction you get a little note, so it really keeps you writing everything the correct way. The strokes fly onto the screen in quite a fun way, and they always look really nice (even if your writing is as bad as mine) You also get the pronunciation of the characters read out to you, so you are constantly fixing that in your brain too. So what characters do you actually learn with it? Well, I tried the beginners’ list devised by the developers, which includes many of the common components and radicals (the parts of the characters, which you also learn), and that seemed like a fairly decent way to start. They also have lists that go along with most of the common textbooks and the HSK exams, which is really useful, and more advanced learners can make their own lists or choose the areas they want to study more of. You can even see mnemonics to help you remember characters or add your own. You’re probably getting the idea that I really like this app, so what are its downsides? Well firstly, the focus of the app is recognizing and writing characters and words; in the default options it doesn’t get you writing sentences (most of the characters have example sentences for you to read.) For this reason, it only really works as one part of your studies, to help you boost your knowledge of recognising and writing characters. Secondly, it’s not a free app. You get to try it free for a week, which is enough time to see whether you like it or not, but after that it costs $14.99 a month (UPDATE: Readers of this blog can now get it free for 14 days and then $9.99 for the first 6 months using this link). For somebody who is just getting started with Chinese or needs loads of practice for class or an exam, you could always sign up for a few months to learn a load of characters, because even if your subscription ends you can still continue to revise the characters you have in store to review. A couple of other smaller things that I would mention: in the phone app there does n’t seem to be a way to see an animation of how to write the whole character (for those of us who sometimes just want to ‘cheat’ this could be nice). You can see the finished version and/or the next stroke, but I couldn’t get it to animate the whole thing. For that you might have to use the website version or another app like Pleco. Another thing which annoyed me is that the app is pretty huge. After I installed it, it was pretty much the largest app on my phone. I’m guessing this might be because of all the audio in the app, but for those who have limited space on your device, this might get to you a bit. Oh and for those who love learning different dialects of Chinese, there are no pronunciations for Cantonese or other dialects right now). 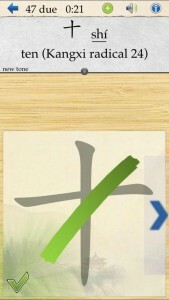 Overall, I think Skritter is a great addition to the Chinese learning tools available to learners. It’s the most fun and effective way I’ve seen to learn characters, and have everything integrated in one place, and for a beginner who is just getting into the language, it’s a really great way to start. 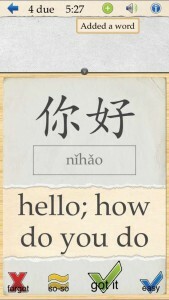 Whatever stage in your Chinese learning you’ve reached, I’d encourage you to give it a try! A really fun app/website to learn Chinese characters whenever you get a spare moment. Learn the characters from your textbook, or customise your own list.